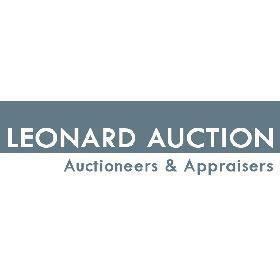 Leonard Auction connects a global market of buyers to our curated catalog of auction lots and makes it easy to buy and sell quality items. We ensure that every item we feature is always represented accurately and given the utmost care through the entire auction process. From appraisal and item pickup, all the way through to final delivery to the buyer, our experienced team of auction professionals ensures a smooth transaction. Leonard Auction offers customers an honest, easy-to-work-with, knowledgeable and experienced partner for all their auction needs. What People Say About Leonard Auction, Inc.
As a first time attendee, I found the experience extremely enjoyable! I have been to very many auctions over the years, mostly in Michigan. I was impressed with the organization of the items for sale, especially the online catalog. The staff was most friendly and helpful. It is a plus that large items do not have to be removed on the date of the sale. All in all, Leonard Auction was the most professionally run auction that I have ever attended. This was the most well run and organized auction I ever attended. Staff was super friendly and helpful, especially Ellen and the front woman at the desk with short dark hair who checked us in and explained everything to us patiently and friendly. The auctioneer spoke clear and was quick and professional and got through the items quickly. The website where you can also watch the auctions was amazing. Very well done, and I was very impressed. We will be attending your auctions in the future for sure! I found that the entire process was thoroughly great. It was a really good experience. The staff has always been really helpful and friendly and they really make you welcome. I would and have recommended your auction to many of my friends. Thank you so much. I received the check today and am so grateful. It will help me to help students who want to do good work for others. You were most kind and so easy to deal with ... I would recommend you to anyone and if I was fortunate enough to have anything else of value, I would not hesitate to come back to you. Just wanted to say thank you again for providing your services for our antiques appraisal program and helping make it a fun and successful event for us. Your professionalism and knowledge were greatly appreciated. Hope we can do it again next year. After interviewing several companies to handle a family estate liquidation John was selected to handle an estate sale followed by auction of the remaining items. He was always direct, helpful and conscientious from the planning, marketing, pricing, operation and cleanup of the estate sale through the timing, conduct, reporting and payment on the auction items. John enjoys his work and is good at it. I recommend him without reservation. We had a family member pass away suddenly in the Chicago area. She had lived in her home for 60 years and had accumulated lots of nice things. We live out of town and had a very limited time frame to remove the items from her home. I searched online for auction companies in the area and ran across this company. I called and spoke with Sue who was very helpful and explained how the process would go if we had things that could be auctioned. John rearranged his schedule to meet with us when we were in town and was quickly able to identify the items in the home that would be worth selling (I was actually very impressed with his knowledge of antiques, art, glassware, etc.). He had a team come over quickly and collect and pack everything for auction. He was very professional and was in constant communication with us during the entire process. We were very surprised by the sum that the items fetched at auction, and we received payment promptly. The commission rate was also very fair and John did his best to keep it as low as possible. I would highly recommend this company to anyone who is dealing with a similar situation and doesn't know what to do. They really came to our rescue during a very bad time. You have a knack for doing things honestly, respectfully and in a consistent and timely manner. Your appraisals, previews, auction and final postings have the nicest touch. All of your are so warm and personable. So, thank you for the wonderful gift - a final hammer that brought more than expected so many times. It meant so very much to me to offer my late husband's collection of coins and other collections and items he enjoyed with others in your extensive world wide buyers market to view and bid on. Everything sold. You do your job so well.